Overweight and obesity have emerged as the most important disease processes in cats today. The perils of obesity are far-reaching. It shortens cats’ lives and can actually contribute to chronic inflammatory pain. The good news is that obesity is preventable. More good news is that even if a cat is overweight or obese, the disease can be reversed, normal body condition can be restored, and life expectancy can be returned to normal. Overweight and obesity in cats is preventable. Why is obesity so widespread in cats? Many factors of our modern life with cats contribute to the increased prevalence of feline obesity. Cats now live predominantly indoors. They no longer must roam and hunt for their food. That means fewer calories expended. In addition, when cats are permitted to eat free choice (when food is left in the bowl all day), it is easy for cats to eat more calories than they need. The bottom line is that when calories taken in exceed calories expended, weight gain is inevitable, leading to overweight and obesity. 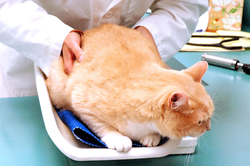 How does being overweight or obese contribute to pain in my cat? As covered in the overview article on the same subject (Overweight, Obesity and Pain in Cats: Overview), Overweight and obesity set the stage for joint damage and osteoarthritis (OA), leading to chronic pain. Until recently, veterinarians thought that the increased pain and inflammation associated with OA in overweight and obese cats was primarily due to the increased wear and tear on the joints. What we now know is that fat tissue is very biologically active and secretes hormones and other chemicals that both cause and enhance inflammation. We now know that fat tissue secretes hormones and other chemicals that both cause and enhance inflammation. Fat itself also contributes to inflammation; inflammation is a part of the pain associated with OA and degenerative joint disease; and overweight and obesity contribute to this vicious cycle. How can I prevent my cat from becoming obese in the first place? 2. Portion control is critical. Most cat food bags overestimate the amount of food a cat needs, so ask your veterinarian for a portion recommendation, and stick to it! 3. Choose specific meal times, and then be consistent. It is a myth that cats need to “graze” or eat whenever they like. Cats learn quickly when food is available and when it is not. This minimizes what we may perceive as “begging” behavior. 4. Consider using interactive feeding toys. These types of toys allow cats to “work” for their food. Cats eat more slowly, and they have the added bonus of expending more calories. 5. Increase your cat’s exercise. We know that optimal body condition score depends on the balance between calories taken in and calories expended. Increased activity may be accomplished several ways. Consider an outdoor enclosure with ledges at various heights to encourage moving around. Such an enclosure is limited only by space and imagination. 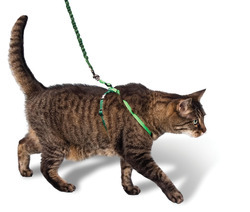 Most cats can also be taught to walk on a leash. They generally prefer to take the lead rather than walking at “heel” like dogs. Cats do best with a snugly fitting harness on the torso rather than attaching the leash to the collar. There are also ways to increase feline activity inside the house. In addition to interactive toys that dispense food, other interactive toys, such as dangling feathers, allow us to play with our cats. Laser pointers can provide hours of chasing fun. Finally, cats can be taught many of the same tasks as dogs—come, sit, stay, up on the sofa, etc. 6. We can assess your cat’s body and muscle condition score at each visit. These assessments can help you keep track of your cat’s condition; if your cat is heavy, your veterinarian can provide you with an estimated ideal body weight to use as a guide during weight loss. 7. Accountability keeps us honest. Schedule regular weigh-ins at your veterinarian’s office to track both weight and body condition score in your cat’s medical record. Trends up or down can be identified early, and minor feeding adjustments can be made. Minor modifications are always easier to make than major transformations. Our feline friends do not deserve to hurt. Fat tissue plays an active role in perpetuating pain. Reversing overweight and obesity in cats—or better yet, preventing it in the first place—is truly a pain prevention and management technique. With a bit of planning and some simple monitoring, cats can maintain the svelte figure nature intended and can live their best life for as long as physically possible.